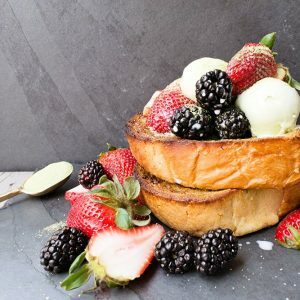 Every kitchen you work at will teach you new techniques and dishes that you’ve never been exposed to. 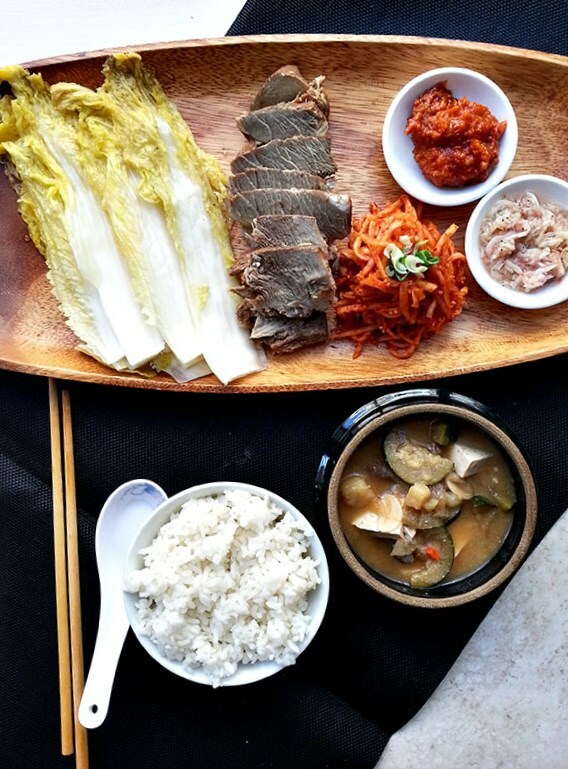 One of my previous jobs at a Korean company taught me several Korean dishes that I had never tasted, let alone heard of, including a dish called bossam. 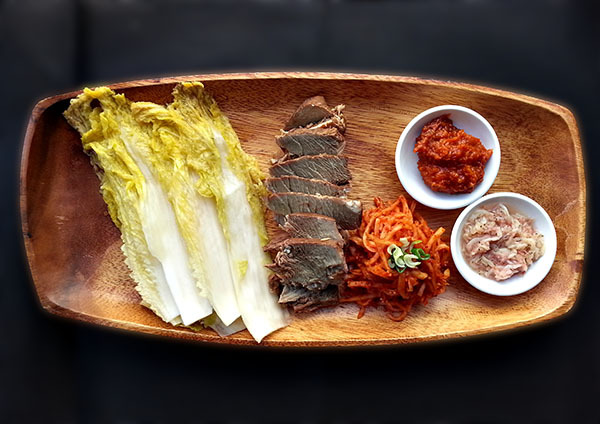 Bossam consists of slow-cooked pork, usually boiled, wrapped in salted cabbage and topped with various pickled items and condiments. 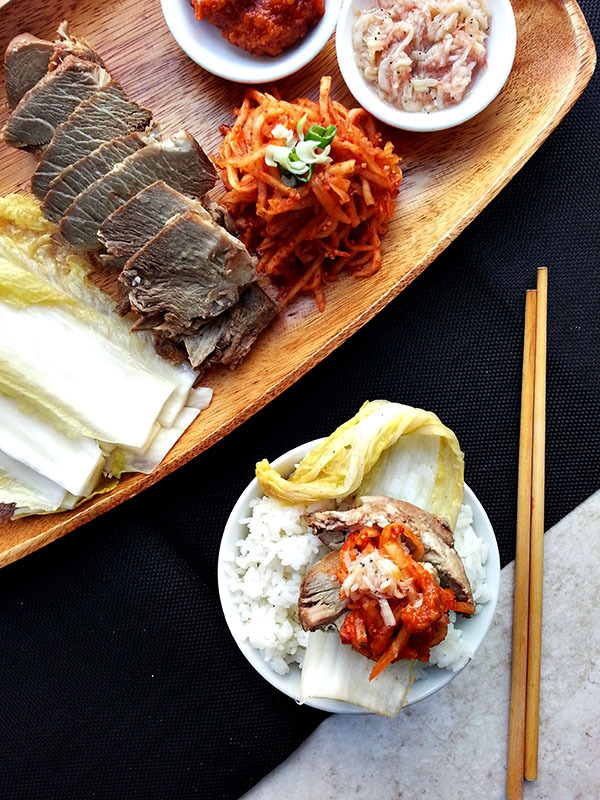 Every component plays a part in the ssam to create one flavor-popping dish. Yet another delicious dish to add on to my list of favorite Korean meals. Whisk together 4 cups of water with 1/2 cup salt, stirring until the salt has dissolved. Cut the napa cabbage head into 4 wedges. Rub the remaining 1/2 cup salt in between each of the leaves. Soak the cabbage in the salted water for 5-6 hours or until the cabbage has softened and can easily be bent without snapping. Rinse the cabbage in water and drain. Set aside. Bind the pork together using twine to keep the pork's shape intact while cooking. Combine all of the ingredients for the pork from the pork - bay leaf in a large pot. Fill the pot with enough water to completely submerge all of the ingredients. 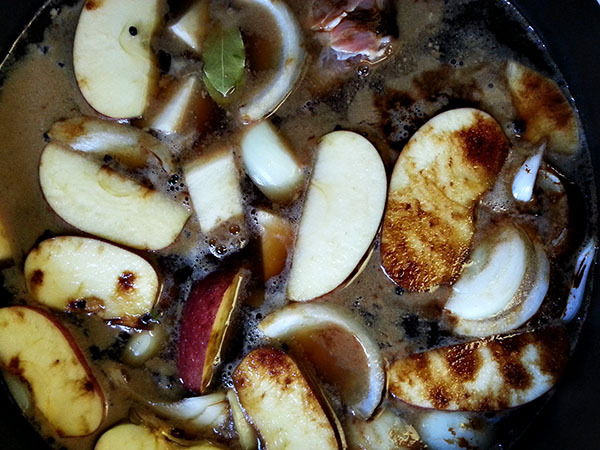 Cover and bring to a boil. 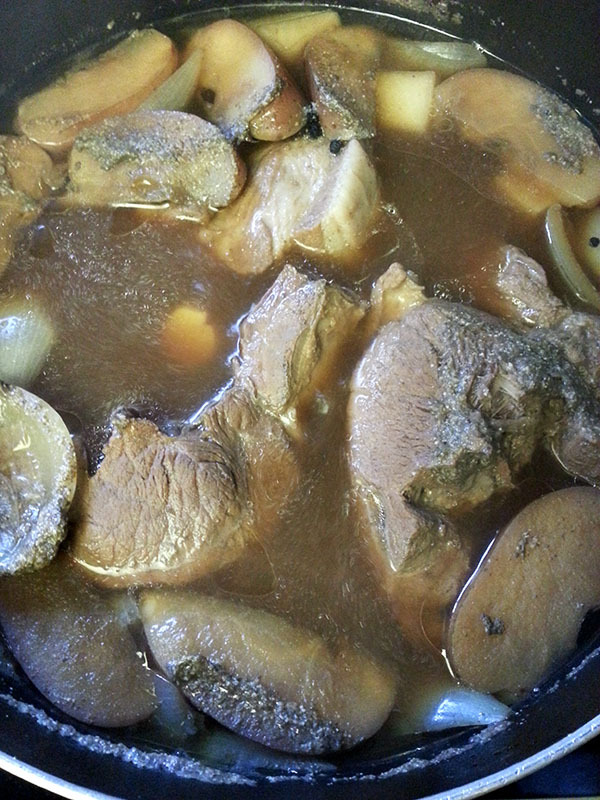 Reduce heat to low and continue to cook the pork at a soft simmer for 2 hours or until the pork is tender. Meanwhile, prepare the kimchi radish. Toss together the daikon radish with the salt and let sit for 10 minutes. Combine the red chile pepper - chives and let sit for 10 minutes. Rinse the salted daikon with water and drain. Mix together the radish with the chile pepper mixture, making sure the radish is evenly coated with the sauce. Set aside. Remove pork from the cooking liquid and let rest for 10 minutes. Thinly slice the pork against the grain. Serve with salted cabbage wraps, kimchi radish, ssamjang, salted shrimp and rice. 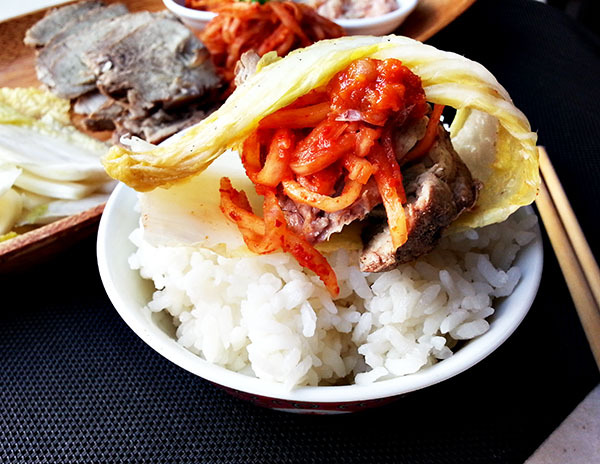 Bossam can be prepared using pork shoulder or pork belly, depending on your preference. Either way, the method is the same for either cut of pork. 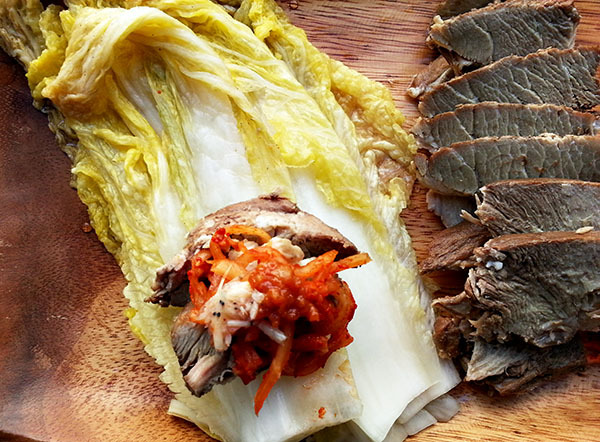 Salted napa cabbage is the most common ingredient used for wrapping the pork but I’ve also had bossam with perilla leaves and butter lettuce. 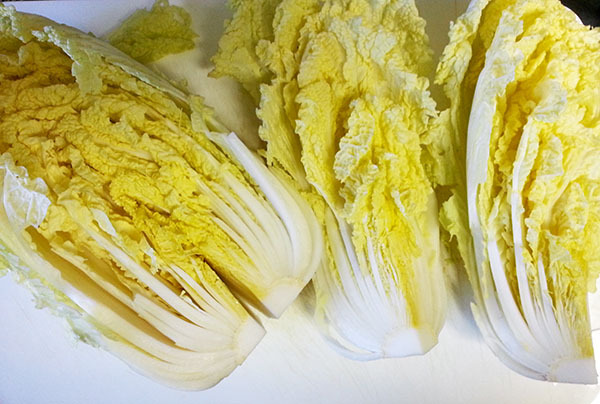 This method of salting the cabbage is the first step in preparing kimchi. How quickly the cabbage softens can also depend on the temperature of your kitchen; the warmer the kitchen, the quicker it will soften. 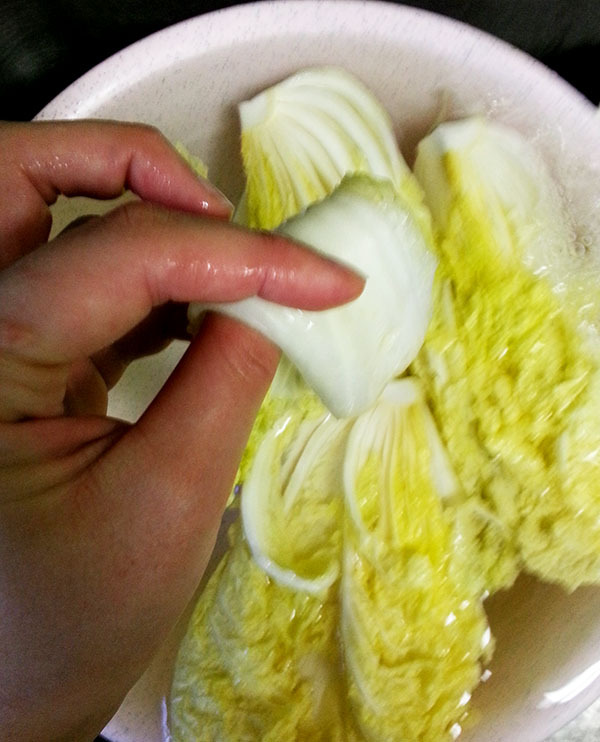 You will know when the cabbage is ready when the thick part of the cabbage can easily bend. This kimchi seasoned radish has many of the same seasonings of kimchi but is not classified as kimchi since it is not pickled. 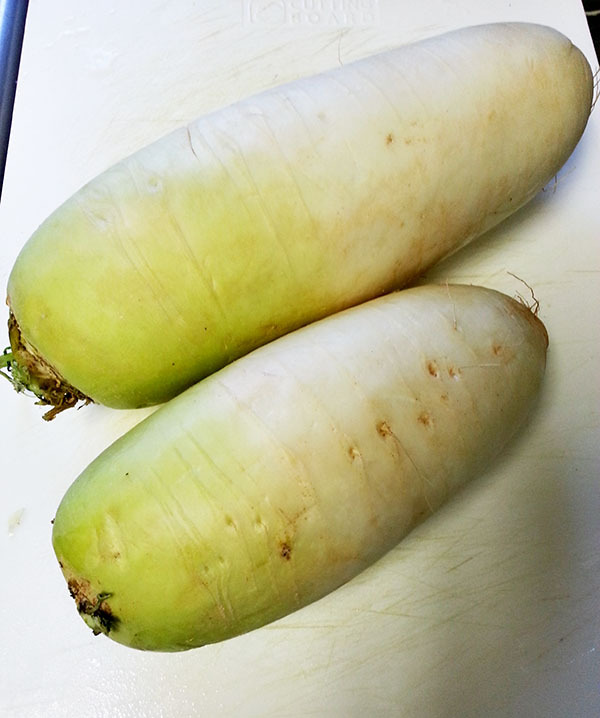 Purchase daikon radish, also known as lo bok, for this topping. This particular radish is popular in Asian cuisines, specifically Japanese and Korean. It is quite large and has a mild flavor. I’ve seen many recipes for bossam that cook the pork only in water and ginger; however, rather than simply boiling the pork in just water, I prefer to season it with aromatics and spices. The Asian pear that is used is also known as Chinese pear, Korean, pear, Japanese pear, and Taiwan pear; one wonders where the pear actually originated from with all these names. Unlike Bartlett pears or Anjou pears, the Asian pear has a high water content with a crisp, grainy texture. Another ingredient that may be unfamiliar is the soybean paste, called “dwenjang” in Korean. This soybean paste is not to be confused with miso, another type of soybean paste. Dwenjang is a fermented bean paste that can be eaten raw or used to flavor stews. I used my leftover bean paste to make dwenjang jjigae on the side (pictured above). Make sure to monitor your flames and keep the heat on low; you want to slow cook the pork to yield tender pork rather than quickly cooking it on high heat. Ssamjang is one of the condiments served with bossam. It is a mixture of dwenjang and gochujang, Korean red chili paste and the mixture can be either be made or purchased at an Asian market. Ssamjang is a thick spicy paste that is a common sauce used in Korean bbq, adding the salty and spicy factor to the meat. The salted fermented shrimp is another condiment that adds the salt to the wrap. Be careful to only add a small portion to the wraps since they do carry a large amount of salt. 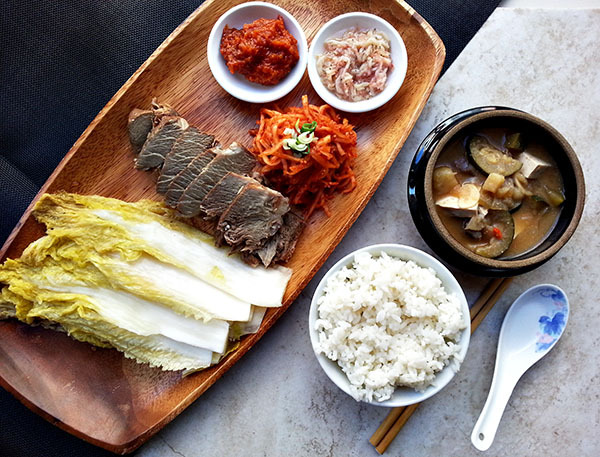 Many restaurants that serve bossam offer other side dishes such as seafood pancake, kimchi stew, and dwenjang jjigae. I enjoyed my bossam with a side of dwenjang jjigae and a small bowl of rice. You can also top the wrappings with fresh oysters, another common way to serve bossam. It has been at least a year since I had this dish and once I bit into the wrap, I was immediately reminded of why I loved it in the first place. 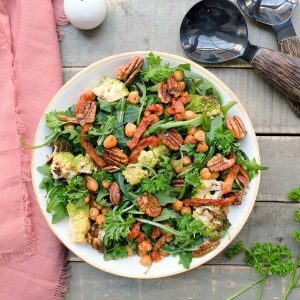 Such a simple dish that comes together with the help of condiments and toppings. Can I have some more, please?